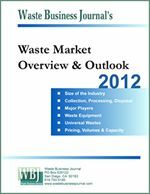 Waste Management, Inc. (NYSE: WM) announced today that it has priced an underwritten public offering of $600 million aggregate principal amount of 4.75% senior notes due June 30, 2020 under a shelf registration statement previously filed with the Securities and Exchange Commission. The notes will be fully and unconditionally guaranteed by the Company's wholly-owned subsidiary, Waste Management Holdings, Inc. The notes have been assigned the rating of BBB by Standard & Poor's and are expected to be assigned the rating of BBB by Fitch and Baa3 by Moody's. The offering is expected to close on June 8, 2010. The Company plans to use the net proceeds of the offering, together with cash on hand, to repay $600 million of 7.375% senior notes that mature in August 2010. Banc of America Securities LLC, Barclays Capital Inc., Citigroup Global Markets Inc., and Goldman, Sachs & Co. acted as joint book-running managers of the offering. In addition, BNP Paribas Securities Corp., Deutsche Bank Securities Inc., J.P. Morgan Securities Inc., Morgan Stanley & Co. Incorporated, and RBS Securities Inc. acted as co-managers of the offering. Copies of the final prospectus supplement and related prospectus for this offering may be obtained by visiting EDGAR on the SEC website at www.sec.gov or, upon request, from any of the joint book-running managers at: Banc of America Securities LLC, 100 West 33rd Street, 3rd Floor, New York, New York 10001, Attention: Prospectus Department, or by calling toll free at 1-800-294-1322; Barclays Capital Inc., c/o Broadridge Integrated Distribution Service, 1155 Long Island Avenue, Edgewood, New York 11717, by calling toll free at 1- 888-603-5847, or by emailing barclaysprospectus@broadridge.com; Citigroup Global Markets Inc., Attention: Prospectus Department, Brooklyn Army Terminal, 140 58th Street, 8th Floor, Brooklyn, New York 11220, or by calling toll free at (877) 858-5407; Goldman, Sachs & Co., Prospectus Department, 200 West Street, New York, NY 10282, by calling toll free at 1-866-471-2526, by facsimile at 212-902- 9316 or by emailing prospectus-ny@ny.email.gs.com. Waste Management, Inc., based in Houston, Texas, is the leading provider of comprehensive waste management services in North America. Through its subsidiaries, the Company provides collection, transfer, recycling and resource recovery, and disposal services. 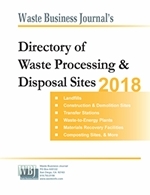 It is also a leading developer, operator and owner of waste-to-energy and landfill gas-to-energy facilities in the United States. The Company's customers include residential, commercial, industrial, and municipal customers throughout North America. This press release may contain forward-looking statements. The Company, from time to time, provides estimates of financial and other data, comments on expectations relating to future periods and makes statements of opinion, view or belief about current and future events. Statements relating to future events and performance are "forward-looking statements." The forward-looking statements that the Company makes are the Company's expectations, opinion, view or belief at the point in time of issuance but may change at some future point in time. By issuing estimates or making statements based on current expectations, opinions, views or beliefs, the Company has no obligation, and is not undertaking any obligation, to update such estimates or statements or to provide any other information relating to such estimates or statements. Information regarding factors that could materially affect results and the accuracy of any forward-looking statements made by the Company may be found in Part I, Item 1 of the Company's Annual Report on Form 10-K for the year ended December 31, 2009 and in subsequent reports filed with the Securities and Exchange Commission under the Securities Exchange Act of 1934, as amended. We caution you not to place undue reliance on any forward-looking statements, which speak only as of their dates.